Remember how I mentioned in this post that some of the game-related treasures I pulled from my boyhood closet (while staying with my parents this past Christmas) surprised me while others brought a smile to my face thanks to the fond memories I have of them? 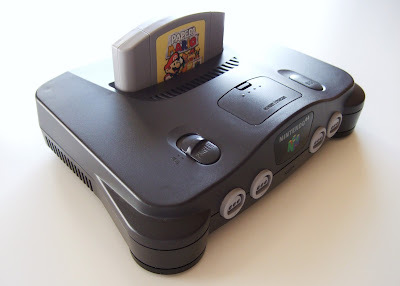 Well, the "find" seen in the photo below--the Nintendo 64 system that I received as a birthday present far too many years ago--falls squarely into the latter category. Another reason the warm feeling of nostalgia washes over me whenever I think about the Nintendo 64: Despite its technical shortcomings, the system was home to a bevy of awesome games. Speaking of which, I pulled more than just a still-in-great-shape Nintendo 64 system from my childhood closet a few months ago; I also pulled a pair of my favorite Nintendo 64 games from that cluttered space. One of those games, Paper Mario, can be seen in the photo above, while the second is none other than The Legend of Zelda: Ocarina of Time. Sadly, I couldn't find the boxes that originally housed these games. I was able to find a rather crumpled manual for Paper Mario, though, so all of my digging wasn't completely without merit. Nice find! I've got...thirty-ish games for mine. It's on its last legs, though...well-loved! You've got 30-ish N64 games, Justin? My gosh, that's a lot! I don't think I ever owned more than about 10. Which ones are your favorites, by the way? Yes, Marco, OOT is awesome. I really should re-play that one, too. First, though, I have to re-experience Paper Mario. Gosh, I love that game. I still have my old N64 and tons of games, all in-box. I was a huge Rare fanatic -- Jet Force Gemini, Banjo-Kazooie, Blast Corps, Donkey Kong 64, etc. Not a good system for niche games and RPG's, but I didn't discover those until the PS2-era. Ah, I'm jealous, warp! I've always wanted to play Jet Force Gemini, especially. Not sure why I ignored it back in the day. Guess I'll have to look it up soon. Other than that, you're right about the N64 and niche games and RPGs. Thankfully, the PS1 covered both of those areas pretty well, which makes it easy for me to appreciate all that the N64 was able to offer (great games like Mario 64, especially). Very nearly finished collecting every N64 game I feel is worth owning. Have loads of carts and have bought a few on Virtual Console, especially the ones that are too expensive. Unfortunately most are PAL, only got an NTSC machine recently but it's too much hassle to start again looking for US games. Superman N64 was my last (unfortunate) acquisition :) There's not a lot of great games on it which makes it easy to collect for. Still some classics there but I'm surprised how badly a few have aged, mostly the games by Rare. Yeah, I definitely thought about that, Retr0gamer--that the N64's overall lack of games (esp. good ones) makes it easy to collect for. I have a rather short list of must-own games, thankfully--the ones mentioned above, plus games like Harvest Moon 64, Majora's Mask, Mario Golf and Tennis, etc. I've already bought some of them via the Wii Virtual Console, but I can't help but want physical copies of many of them, too. BTW, which games do you think have aged especially poorly, if you don't mind me asking? Goldeneye and Perfect Dark are the big two, they really have aged terribly. Donkey Kong 64 was never good but was over rated at the time. I really don't like Conkers Bad Fur Day. It's an ok platformer and the writing is terrible, not funny and consisting of fart jokes. Blast Corp is really the only Rare game I'd call a timeless classic on the N64. Banjo Kazooie is still good, Tooie less so but still fun. The frame rate in Jet Force Gemini really lets it down but otherwise I still think its a great game. Well there's my Rare on N64 rant. Hope I don't start any flame wars, I usually do when ever I mention Goldeneye not being good when the rose tinted specs are lifted. Well, you won't get any complaints from me RE: Rare, Retr0gamer. I liked the Donkey Kong Country games, but that's about it as far as Rare's output is concerned. I owned Donkey Kong 64 as a kid and I can't remember a single thing about it, which suggests to me that it was, indeed, crap. I also believe I owned Banjo Kazooie, but I can't remember anything about it, either. I'm not an FPS fan, so I've always avoided Goldeneye and Perfect Dark. Really, the only Rare games I wish I had played but didn't is Jet Force Gemini (and maybe Star Fox Adventures?). N64, not many great games but the ones that were are absolutely brilliant. I have to disagree with Retr0gamer on Goldeneye, I think it's still a brilliant game to play. Yeah, the graphics are obviously not on a par with today but I still find it to be a fun game to play, even with having to suppress the urge to bloody shoot Natalya. Maybe it's me being a PC gamer at the time but I liked goldeneye when it was released but as soon as Half Life came along, it really started to show its age. It was very creative for it's time and as some good levels but there's a lot more really poor levels than good ones. The framerate is atrocious and some of the level design choices like flakey stealth mechanics and respawning enemies deserve to be relics of the past. Things like framerate don't bother me in the slightest, as long as I find a game to be fun and enjoyable then generally I'm not fussed about the other stuff. I have a lot of good memories of the N64 too. One of my roommates in the late 90s had one and the three of us spent massive amounts of time playing the great multiplayer games for it (Mario Kart 64, Goldeneye, etc). I would actually say that is the thing that really sets the N64 apart from the Playstation, which has a terrible record in terms of multiplayer games. dste: Yes, you're definitely right about the N64 having just a few games, but a good percentage of them are great. I don't think any of my N64 boxes lasted very long. That and my GBA ones. Such cheap cardboard. As for Paper Mario: Oh, yeah, it's a great game. I like the N64 original better than the GC sequel, too. The latter is a great-looking game, and a lot of fun, but I still prefer the original. I'm looking to buy Mischief Makers again, too! I loved that game, and I regret selling it. Blast Corps, too...but my favorites? Rocket: Robot on Wheels, Space Station Silicon Valley, Super Mario 64. Yup. Mine was huge when I bought a PS2...it seems that e spend a very long time wanting games for systems we don't currently own...that's what stops me most often from buying a PS3...so much out there! pretty sure i have a box for ocarnia of time sitting around somewhere, gotta double check first but you'd be welcome to take it. encouraged, even. Hey there, sharc! Well, if you do have it and if you do really want to give it away, I'd gladly take it! Just let me know. And thanks for offering, regardless! yep, i do have one. it's missing the cardboard insert that holds the cart itself but you can poach one of those from anywhere. no idea how to exchange info to send it though, don't have a blogger account. if there's any kind of private contact method kimimi might be able to act as an intermediary. Thanks for offering this, by the way!